A few months back (eight to be exact), I sat on an airplane and buckled up for a four-hour flight. Beside me sat a man in neat, business attire. He perused the airline magazine while we prepared for take-off. Thirty-minutes later, we were deep in the throes of a fascinating conversation. I'm sure I started it. I can't, for some inexplicable reason, just sit beside someone for four hours and mind my own business. This has pros and cons, obviously, but it usually turns decidedly for the pros side of things. 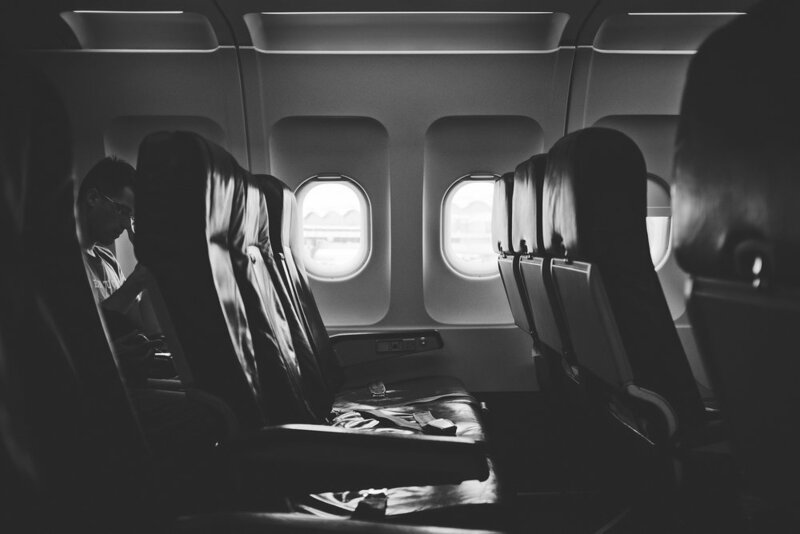 I've learned a lot about people on long flights, namely that strangers seem to feel a certain safety above the clouds that enables them to part with long-held secrets; they've divulged life-long fears, closeted affairs, deep regret and unhappy marriages, to name a few. All of it is fascinating. Back to the recent flight. The man beside me chatted with me about his work (sales manager) and his life in general (wife of 30+ years, two grown kids, nice standard of living). "What would you say, at the age of 60, you've learned about life? If you could sum it up in one sentence, what would it be?" He thought for no more than sixty-seconds. "Life is too short to do anything you don't love. Seriously. There are times we must do things we dislike, but if at all possible, limit those times. More of it is within your control than you realize, and life is shorter than you know." He told me about how important it is to love one's work, since we spend so much time doing it. He told me it's important to love your family and show them that love because now that he's 60, those memories and the future ones he plans to create matter more to him than anything else. He said he can't imagine spending his life with a partner he didn't truly love and enjoy because it has made all the difference in his ability to appreciate everything else. He cried. A lot. He apologized for such a flood of tears, saying it was very much unlike him, and he wasn't sure why he was so emotional. When the plane landed, he shook my hand, gave me a hug and went on his way. I don't even know his name. I can only see an image of him in my mind's eye, brown hair with patches of gray at the temples, glasses, maybe an extra fifteen pounds, a sweater vest over a plaid button-down shirt and silk tie. I often think about what he said. I think about it when my husband goes off to work. I think about it when I gear up for chores or grocery shopping or prepping dinner. It really makes me stop and consider, as I go about my day, how much of what I do I really love and enjoy and how much of it is drudgery or tedious or downright distasteful. It makes me think about my relationships, particularly my friendships. For years, I collected friendships because I thought that's what a happy, well-adjusted, normal person did. I wanted as many friends as possible because I hoped it would fill me up. Now I think about how happy some of those relationships have made me and sometimes....not. I think about this man's comments and realize how good so much of my life is, which is strangely easy for me to forget. I look around and think: what could I change? What could be better? There are opportunities, of course, but the bulk of it is good. Better than I may sometimes imagine. This all makes me think of the poem Welcome Morning by Anne Sexton, which I re-read often to remind myself to give thanks for all of this goodness. I plan to ask more people the question I asked that man, to listen to what other people have to say about their lessons learned, what they've found to be true, how they might sum up life in a sentence or two. We are all shaped by our experiences, which means we all have unique perspectives, values and interpretations. Isn't it lovely to hear them all?